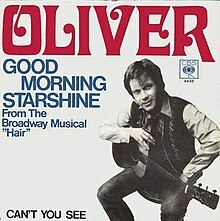 1969 Song of the Day- “Good Morning Starshine” by Oliver. 1969 was a huge year for Oliver- born William Oliver Swofford of North Wilkesboro, North Carolina. Going by Oliver he had the only three Top 30 hits of his career in 1969- this one- Good Morning Sunshine from the musical Hair- #3, Jean- from the soundtrack of The Prime Of Miss Jean Brodie and Sunday Mornin’ #35. The song was written by James Rado, Gerome Ragni and Galt MacDermot- and produced by Bob Crewe- who was The Four Seasons producer. A hippie music classic- the song certainly sounds dated today. While Oliver had a huge start to his career with 2 Top 5 hits- he was not able to carry on that momentum and was out of the music industry within a decade. He died young from cancer at the age of 54 in 2000. I don’t remember hippy chicks looking that good. Me either.. most hippies I remember seemed kind of smelly.